Over the years I’ve come to the conclusion that Japan has great taste in Western pop music – Shampoo notwithstanding – for as a nation they’ve continued to embrace releases from people we’ve come to ignore in our home countries. When Swing Out Sister and Cyndi Lauper made the best records of their careers (Shapes and Patterns and Shine, respectively) and their record companies said “actually we won’t bother thanks,” Japan said “ooh, yes please.” Only those of us used to scouring the import department in the dear, departed Tower Records had any hope of finding these albums, and we needed pretty deep pockets to get them as they would often set you back around thirty quid. 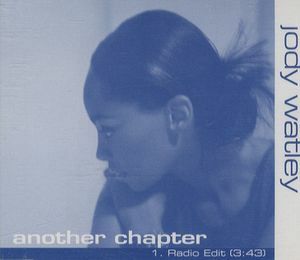 Former Shalamar leading lady Jody Watley falls into this category too, thanks to 1999’s quite exceptional The Saturday Night Experience, a project which saw her delve into Electronica and Deep House after a career based largely on R&B and straight up pop. It was a change that suited her spectacularly well, as lead track Another Chapter demonstrates. Click here for the song, which frustratingly will not embed. Some songs just excite you from the get-go, and Another Chapter is one such – it feels almost like you’ve wandered straight into the middle of the record until Jody pipes up to say “Every story has a beginning, a middle, an end….it’s life.” Relentlessly danceable, it also possesses a lovely jazzy warmth that works brilliantly with Jody’s gloriously purred vocal. What I don’t understand is why not a single Western record company executive saw the marketing potential in Another Chapter: given it came out in November 1999 just as the world was on the brink of moving on to – yes – another chapter, this could have been an anthem of optimism and positivity to fill clubs, rule the charts and send us all merrily into the 21st century. I did my best from a small DJ booth in a bar in Glasgow, but I can’t do everything. Who could sing this today and have a hit? Just about anyone, but part of me really wants to hear Cheryl Fernandez-Versini do this in her native accent.